﻿ Print4biz - Greeting Card printing prices including free artwork. Artwork production is free for items on this page. All cards are creased for easy folding - but are supplied unfolded. VAT is charged extra - click for more info. Litho printing onto 350gsm silk art board. Supplied creased but unfolded. Litho printing onto 250gsm silk art board. Supplied creased but unfolded. Greetings Cards can be glossy or matt laminated or UV varnished. We also stock Greetings Card Board - it's glossy on the front and matt on the back for easier writing. Metallic gold and silver printing is an option for greetings cards. 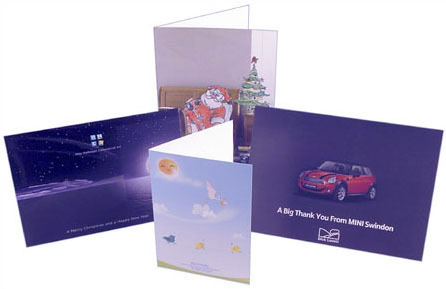 Print4biz - Greetings Card printing prices. Litho and digital printing of greetings and invitation cards. Free proofs. Free mainland delivery. Free document check. printing, greetings cards, custom cards, bespoke cards, Christmas cards, birthday cards, anniversary cards, wedding cards, party cards, invitation cards, folded cards.